HomeComic NotesComic NewsThe Story of British Comics So Far: Cor! By Gum! Zarjaz! This summer a unique new retrospective will open at The Lightbox gallery and museum which will take visitors on an interactive journey through the past, present and future of sequential art. ‘The Story of British Comics So Far: Cor! By Gum! Zarjaz!’ (6 August 2016 – 31 December 2016) will reveal how and why visual communication endures as a hugely popular medium for people of all ages. Zara and her grandfather Alan, manga influenced comic characters especially created for this exhibition by up-andcoming female designer Asia Alfasi, will lead visitors through three immersive zones which will explore the history of British comics to date. The story will open with ‘Cor!’ – a potted history of the importance of sequential art with ancient examples of 3,000 year old hieroglyphics, 18th century satirical social commentary by William Hogarth, and a present day playful yet political ceramic by Grayson Perry. 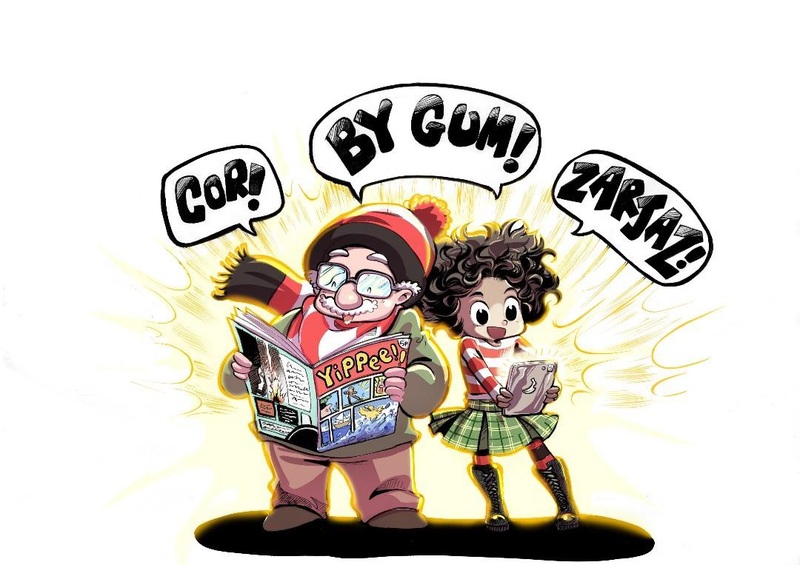 ‘By Gum’ will offer a trip down memory lane with a newsagents stocking classic examples of comics such as ‘Dan Dare’, ‘The Beano’ and ‘The Eagle’ alongside DIY comic making interactives for visitors of all ages. ‘Zarjaz!’ will bring things up-to-date with today’s manga, graphic novels and digital comics, and the exhibition story will culminate in larger-than life giant interpretations of Zara and her grandfather, by theatre scenic painters. As visitors enter the gallery they will be drawn into a ‘library’ of precious artefacts that will give context to the meaning of sequential art. The oldest item will be a 3,000 year old ancient Egyptian stone lent by the Petrie Museum of Egyptian Archaeology. Through hieroglyphics this stone tells the story of a man from the Family Stela of Bakenmin travelling back in time and reflecting on the different stages of his life. Alongside the stone will be on loan from Brighton Libraries beautifully carved woodblock print from 1850 by Japanese artist Utagawa Kuniyoshi which chronicles the lives of brave Samurai warriors from yesteryear. This will be displayed with contemporary examples of comic ‘heroes’ so visitors can compare and contrast the old with the new. parochial village who worship the body rather than religion. The final element of ‘By Gum!’ will be a family-friendly DIY comic making area where people of all ages can create their own piece of sequential art using the materials provided. Families will also be able to build their own Egyptian stone or Hogarth jigsaw puzzle or create their own story by adding speech bubbles to copies of the prints. To keep little ones entertained, there will be a pond filled with comic covers where they can ‘go fish’ for their favourite. Visitors will exit to the final zone through a timetravelling tunnel showcasing the comics of the 70s and 80s including 2000AD and Action which will transport them back to the present day. highlight the influence of the past on the present. Visitors will be able to view two contrasting artists’ studios, one recreated in the style of the 1930s which will show original works by Brian White, who wrote the 1930s Daily Mail strip ‘Little Nipper’, which have never been shown in public before. Next to this a contemporary artists’ studio will demonstrate how techniques and processes have changed over time. Things will be brought right up to date with a bank of interactive digital desks and for the more traditional there will be comfortable lounge area with a lending library of comics and graphic novels to peruse courtesy of Surrey Libraries. The story of British comics so far will come to a close with a wall of giant graffiti interpretations of exhibition guides Alan and Zara. ‘The Story of British Comics So Far: Cor! By Gum! Zarjaz!’ will be on show in the Main Gallery at The Lightbox gallery and museum from 6 August 2016 – 31 December 2016.